Everyone's favorite secret agent not only has a license to kill, but a director, a release date, a script, and a star. The 23rd James Bond film was mired in uncertainty for a while, what with distributor Metro-Goldwyn-Mayer being in the throes of bankruptcy and all. MGM is bouncing back, announcing that Bond 23 will go into production at the end of this year, and has a scheduled worldwide release date of November 9, 2012. Daniel Craig is returning to the franchise in what will be his third outing as 007, and the as-yet-untitled film will be directed by Sam Mendes (American Beauty, Jarhead, Revolutionary Road). The script was penned by Neal Purvis and Robert Wade, who have written the four most recent Bond films (The World Is Not Enough, Die Another Day, Casino Royale, and Quantum of Solace), and John Logan (Gladiator, Star Trek: Nemesis, The Last Samurai). The plot is being closely guarded, but Deadline reports that the new film "begins after Quantum of Solace leaves off." 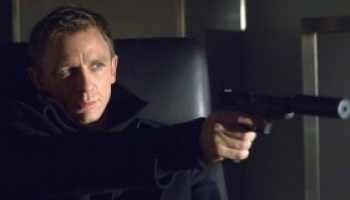 As with every previous canonical Bond film, Bond 23 will be produced by EON Productions. The film was intended for release in 2011, but MGM ran plumb out of money, and so put its Bond plans on hold. In the intervening year, Craig has had the opportunity to fulfill other commitments, such as filming Cowboys & Aliens and getting started on the remake of The Girl with the Dragon Tattoo, both due out this year. I, for one, am looking forward to seeing him in a tuxedo again.